The data indicated that El-Rahawy, Sobel, Kafr El-Ziat and Edfina sectors represent the highly polluted area along Rosetta Stream. Phytoplankton crops recorded downstream the discharging point of El-Rahawy and Kafr El-Ziat Drains were higher than the corresponding values occurred at the upstream areas. At Edfina sector, the numerical density of phytoplankton was high upstream the barrage compared to its downstream sector (Estuarinc) and this phenomenon can be related to the negative impact of high salinity. Bacillariophyceae occupied the first predominant position followed by Chlorophyceae and Cyanophyceae. Diatoms, Green and Blue-green algae constituted about 99% of the total phytoplankton crop. Trace metal contents of Rosetta Branch can be arranged in descending order as follows: Fe > Mn > Ni > Pb > Co > Zn > Cd > Cu > Hg. 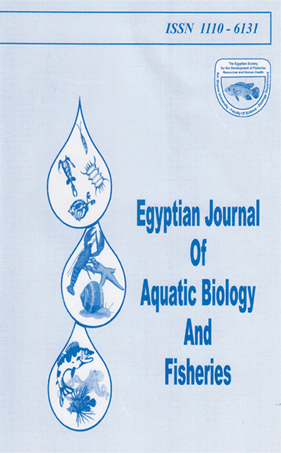 The levels of Fe, Mn and Ni in Oreochromis mloticus flesh collected from El-Rahawy, Sobel, Kafir el-Ziat and Edfina were high compared to the samples caught from El-Kanater Sector.